How To Be A Domestic Goddess by Nigella Lawson is my second favourite cook book for baking (the first being Belinda Jeffrey’s Mix and Bake), and it’s where I came across this lovely pancake recipe. 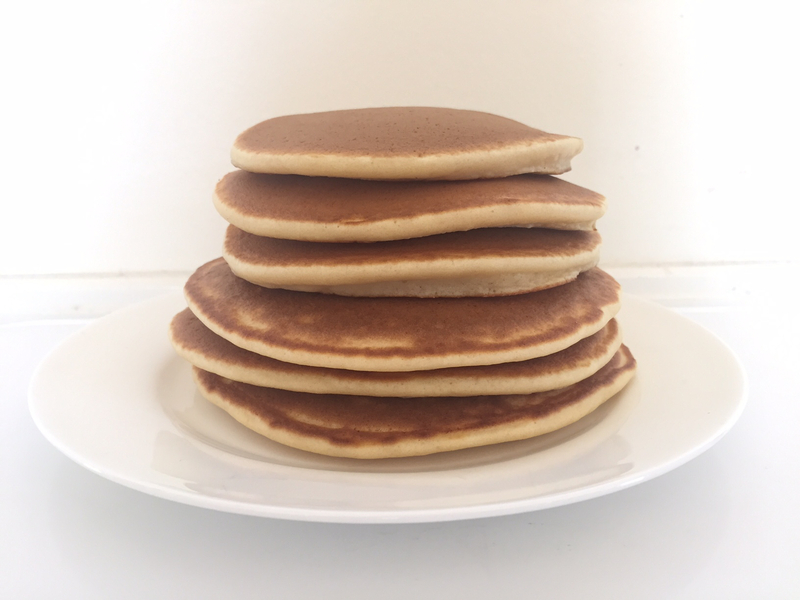 I’ve been using it for more than ten years because the resulting pancakes are wonderful: light and fluffy, and lovely and thick, without being dense or rubbery. The mixture can be used immediately, though it can also be made ahead of time and allowed to stand in the fridge for whenever you need to use it. The batter I made for those in the picture here was left on the bench for only 10 minutes before cooking. The quantities below make 30 medium sized pancakes (just halve the quantities for a smaller crowd) and costs no more than $1.50 to make. Place all the ingredients in either a food processor or stand mixer and mix together until all the lumps are gone. Transfer mixture to a 2L jug, or smaller if halving the recipe. Cook pancakes one at a time in a decent non-stick pan on medium heat. When you start to see bubbles blistering on the pancake it’s time to flip to the other side for no more than a minute. Enjoy topped with whatever you like: lemon and sugar, maple syrup and butter, bacon or berries or ice-cream.